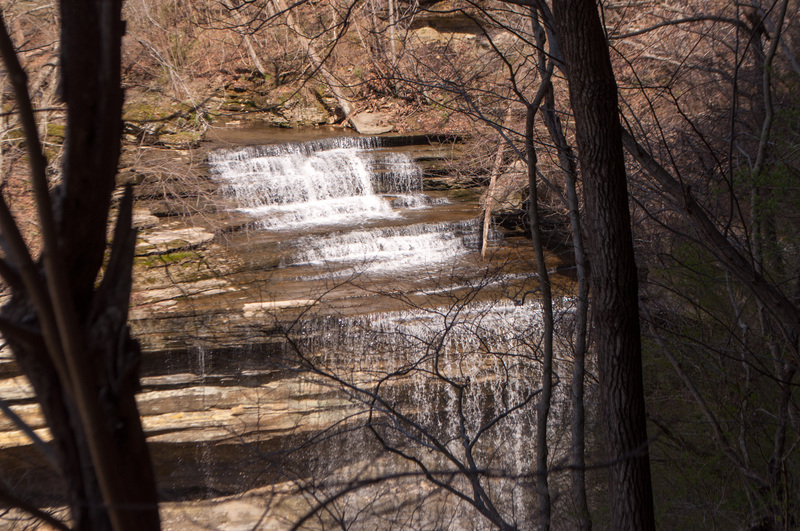 Clifty Falls State Park near Madison, Ind., is awesome. The park has 10 different trails of various difficulty, plus a campground, amphitheater, pool, playgrounds, playfields, and an Inn with views of the park and the Ohio River. To get there, you will pass through nearby Madison, Ind. This charming little town is full of shopping, dining and history – including several places that were part of the Underground Railroad. 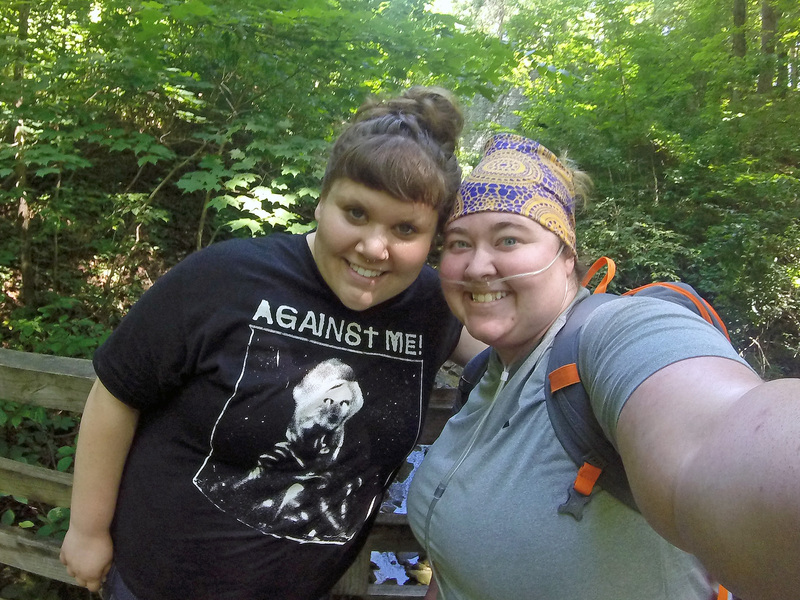 But for the part we really care about – the hiking. I’ve been to this park twice this year and every time I go I like it better. The first time was earlier in spring; there were still no leaves on the trees. The second time I went everything was in full bloom, and I had a lot more time to explore the park. One of the things I like about this park is the trail heads are marked clearly; we never had any trouble finding where we were trying to get. I also love that the trail table on the lower left side of the park map actually gives fairly accurate trail descriptions. This is your view of Big Clifty Falls from beneath the overlook. I had to add the “or hound dogs” part; Emme didn’t seem to think these signs applied to her. We’ve established in previous posts that I love waterfalls. Clifty doesn’t disappoint in this department: there are four that are all relatively easy to access. If you need ADA accessible, there is an overlook at Trail 7 where you can get a good view of Big Clifty Falls. But beyond that, if you can’t do steps, you’re out of luck for all of the trails. 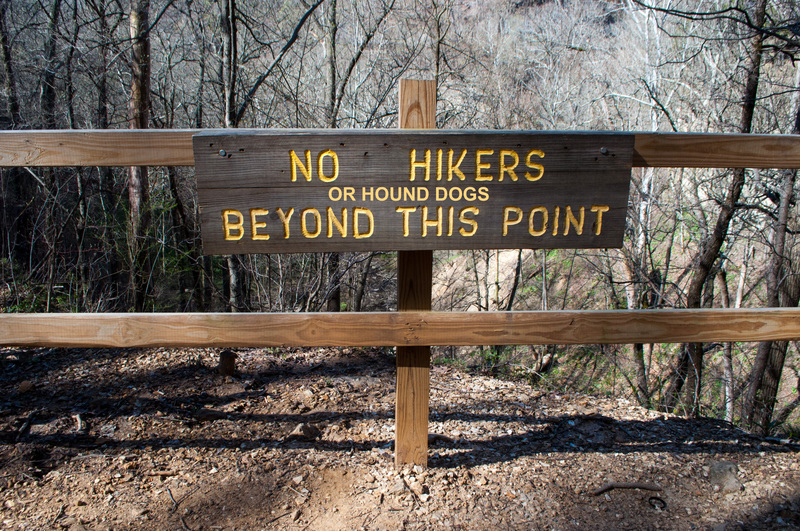 The only drawback with this park is that you can’t really get a good view of any of the waterfalls from the trails and there are umpteen billion signs warning you not to veer off the trail under any circumstances. The trick with most of the trails at this park is getting in and out of the gorges. Everything is situated around the creeks, gorges, caves and waterfalls. Trail 7 was the first one I hit, and at the beginning it seems like it will be too much. It isn’t. 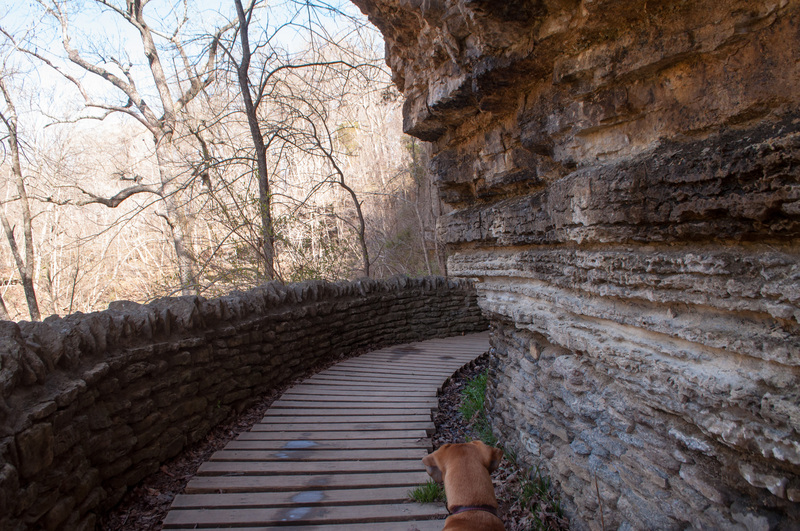 In a rare moment when Emme’s little hound dog nose isn’t pressed to the ground, she looks ahead under the rock ledge. It starts out ADA accessible, then goes down steps. You do have to come back out, but it’s not as bad as it seems going in. Take a right halfway down the first batch of steps and the trail will take you under a rock ledge to another view of Big Clifty. 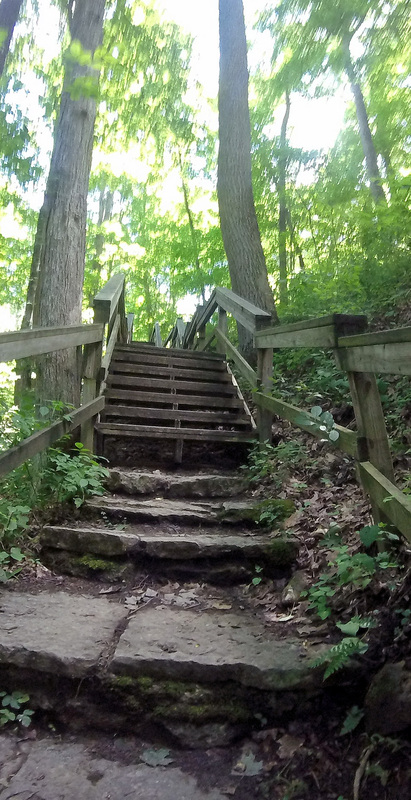 When you get back to the steps you can either keep going straight or take another right and complete a short loop through the woods. 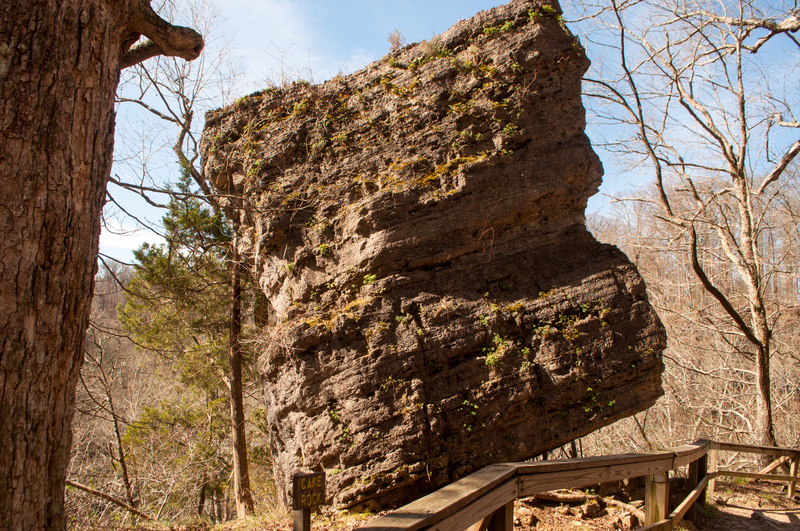 The highlight of this itty bitty trail is seeing Cake Rock, a huge boulder that looks like a piece of cake balancing on its side. 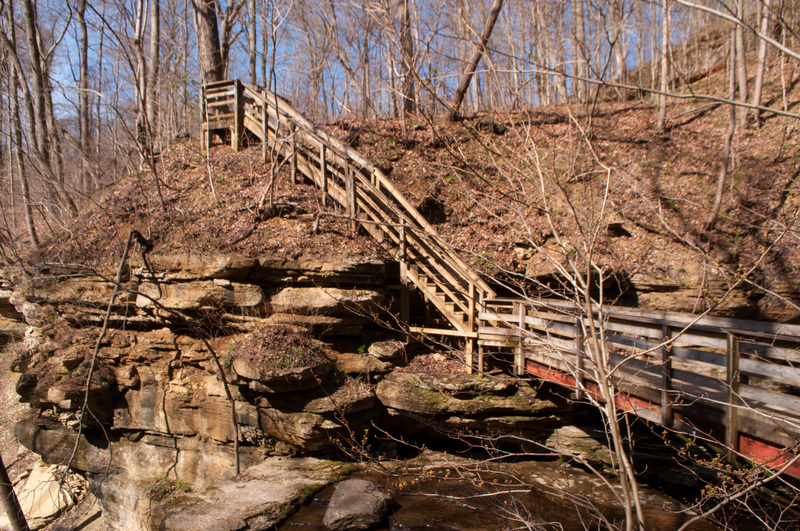 These are the steps getting to Little Clifty Falls. Don’t worry – you only have to go down them. The loop will bring you to the other side of the steps – so you’ll be left of where you started at the top of the steps. 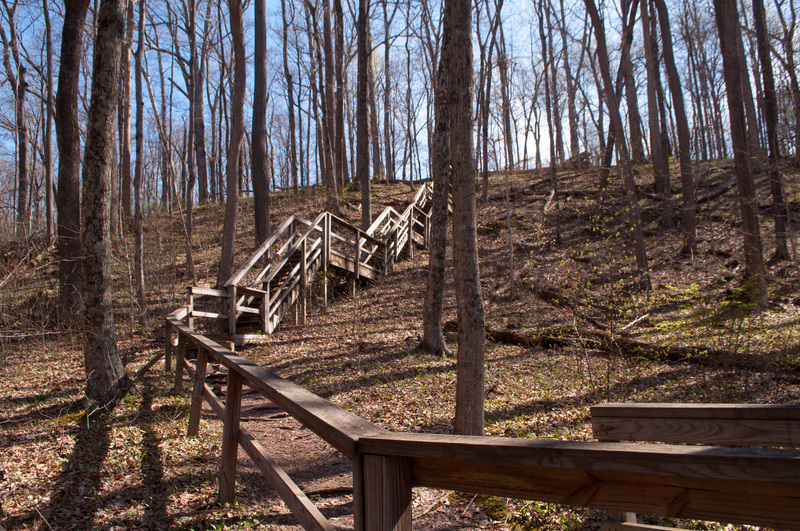 Take a long, narrow set of steps down and you’ll be standing on top of Little Clifty Falls. I love standing there and watching the water go over the falls. But once you’re across, you can go right and walk along the top of the gorge and get more views of the falls. Once you make that right turn, you’re on Trail 6, a half-mile trek which leads out to the Hickory Grove Shelter. This is a piece of the steps leading back out of the gorge. It actually isn’t as bad going out as it seems like it would be when you’re staring up all those steps. If you opt to keep to Trail 7, you’ll make your ascent. The first time I did this trail, I looked at those five sets of 17 steps, lost all heart, turned around and went back the way I came. It was a mistake. Once you get up those steps, it’s a mostly level trail along one side of the gorge, across the creek and back up the other side. The trail comes out at the ball fields across from the parking lot at the trailhead. The trees and weird angle of this shot of Tunnel Falls isn’t helped by my foggy GoPro lens. I’m getting tired of lugging a DSLR around, but I haven’t mastered GoPro photography yet. But this is another example of the difficulty of seeing the waterfalls from the trails on top of the ridge. I cheated a bit on this trail. It’s a bit more rugged than Trail 7, but I really wanted to see the falls and the tunnel. There’s no ADA portion to get you started, once you park at the trailhead it’s all downhill. Literally. Back down into the gorge you go, down a long set of steps. Once you get to the bottom, an overlook gives you your first view of Tunnel Falls, a long, lean flow over the rocks. Someday I will remember to count the number of steps on a trail. All I can remember about this one was there was a lot of steps, but they were still over before I knew it. I was a little worried about the difficulty of the trail, but we kept going back to the tunnel and it was pretty easy going to the mouth of the cave. Once you get to the cave, you’ll have to pick your way over rocks to get inside, and if you’re more than five feet tall you’ll be ducking about fifteen feet into the cave. I didn’t get much farther than that because brilliant me left my headlamp in the car and it was a bit dark in there. I didn’t want the only joint I rolled that day to be my ankle. For a fun bit of history for you, this tunnel is part of what’s known as “Brough’s Folly” because it was part of a failed attempt to build a railroad. The tunnel was started in 1852. When you visit, keep in mind that Trail five and the tunnel are only open in the summer to protect the bats who live in the cave. On the trail around Hoffman Falls you’ll cross a couple of bridges over pretty little creeks, like this one. If you feel froggy, you can continue on Trail 5 until it dead ends to trail four, and take that to Hoffman Falls. Or you can wimp out (like I did) and hike back out on Trail 5 and drive to the trailhead for #3 and hike down to Hoffman. Trail four is rated very rugged and I wasn’t sure of my ability to complete it. Spending more time catching my breath than hiking isn’t how I like to spend my outdoors time. Getting down to Hoffman falls was another trek down steps, but I loved this trail. You’ll cross a couple of creeks and you can use this tail to get down to Trail 2 – my nemesis. But more on that later. Once you get past the falls, Trail 3 joins with 1 and 2. Following trail 3 will loop you back to the trail head, but I was starting to run low on oxygen so we turned back before completing the loop. 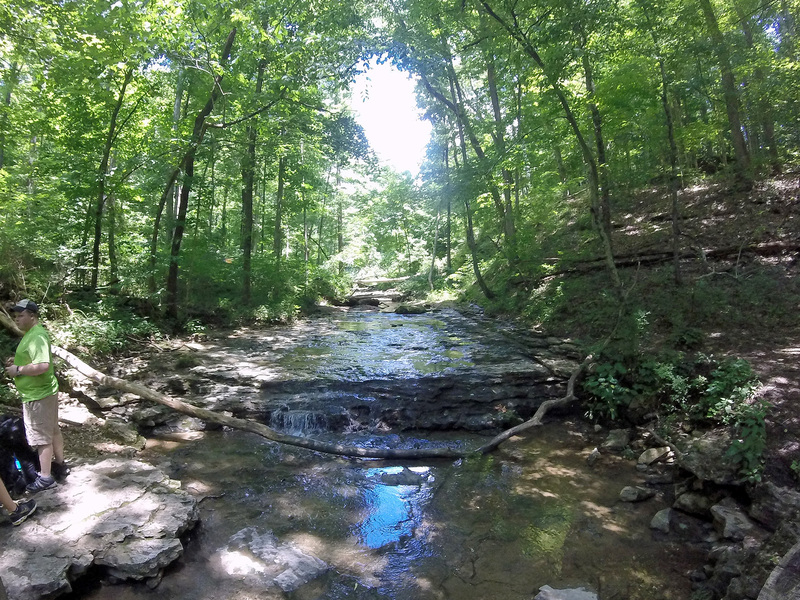 Or you can take Trail 2 when they split and hike up the creek bed all the way up to the base of Big Clifty Falls. Speaking of Trail 2, this one is a bit of my nemesis. I haven’t been brave enough to try it because to hike it you are climbing along a creek bed. Of course, because you are hiking under the falls this is probably the best way to get a good shot of the falls. This trail is a goal for me – I know I don’t have the strength right now – or the footwear – to climb over rocks and play in the water. But next time. Next time, Trail 2, I’m coming for you. There is more to the trails and more trails than what I discussed here. I haven’t had the chance yet to spend much time in Madison, but it’s a place I plan to go back to. I just don’t think the pretty people enjoying their Sunday want to smell me after I’ve been rolling around in the woods for hours. Wear proper footwear because the trails go up and down steps, over roots and rocks and through the woods. The volume of the waterfalls depend greatly on the rain. If there has been a lot – like so far this summer – they’re going to be more voluminous. But that also means that Trail 2 may not be passable because there will be too much water flowing. So check the weather before you go or else you may be disappointed. There is a charge to get into the park: $7 for state residents, $9 for out-of-state visitors. 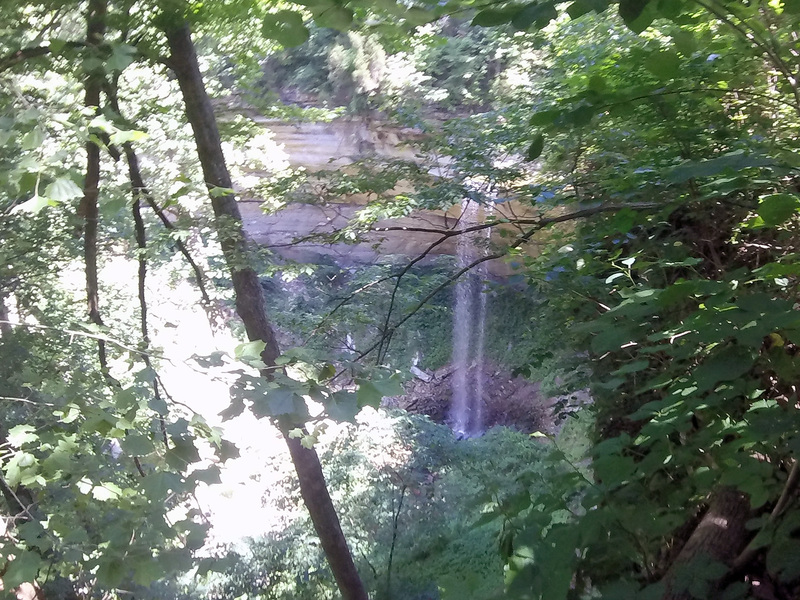 This entry was posted in Adventures, Day Trips, Hiking, Indiana, Indiana State Parks, Road Trip and tagged Cliffs, Clifty Falls State Park, hiking, Indiana, Indiana State Parks, Road Trips, Waterfalls by Cassie. Bookmark the permalink.